CloudAhoy app version 3.5 is now available for download on Apple’s app store. 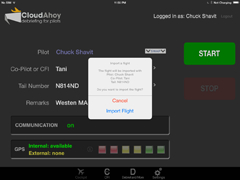 The CloudAhoy app can now import flight data from other apps, in KML and GPX format. This allows you to upload flights which were logged by other apps into your CloudAhoy account. To import, use a “Share” (or equivalent) button in the app that has the data, export in either KML or GPX format, and select CloudAhoy as the receiver of the data. 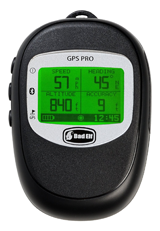 This new feature is useful to import GPS flight data from external loggers. Until now, you could use your iPhone or iPad with an external GPS devices such as Bad Elf Pro to log flights with the CloudAhoy app. This method has two advantages: it auto-stops the logging, and the upload is fully automatic. However, we had requests from pilots who wanted to use their Bad Elf Pro’s stand-alone logging capability without using an iPhone or an iPad in the cockpit. With CloudAhoy’s new import feature you can now use Bad Elf Pro’s stand-alone logging capability. This method requires a few more (simple) manual steps, but it’s advantageous if you don’t have an iPhone or an iPad in the cockpit, or if you want to take advantage of the long battery life of Bad Elf Pro. Important: using the Bad Elf app, tap Configure and set the Data Logger “Smart Filter” to “Disable”. Remember to stop the logging at the end of the flight. Use Bad Elf Pro’s stand-alone logging function to log the flight. No need for an iPhone or an iPad. At the end of the flight, stop the logging on the Bad Elf Pro device. Pair the Bad Elf Pro with your iPhone or iPad, start the Bad Elf app, select the flight from Trips, and tap “Share”. A menu of apps will be displayed. Select CloudAhoy. CloudAhoy will pop up and ask you to confirm the upload. The flight will now be uploaded automatically to your CloudAhoy account, ready to be debriefed. Important: the flight will be imported to CloudAhoy using the current settings of pilot names, tail number and remarks. If the imported flight’s setting is different, you can change it in the CloudAhoy app before the import, and you can also edit the flight afterwards (from the Flights tab).